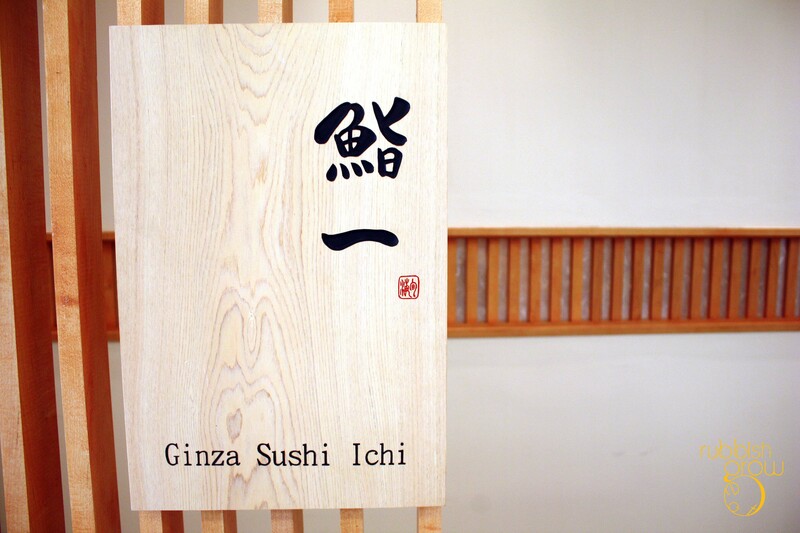 NOTE: Ginza Sushi Ichi has moved to Marriott Hotel, which is next building to Scotts Square. 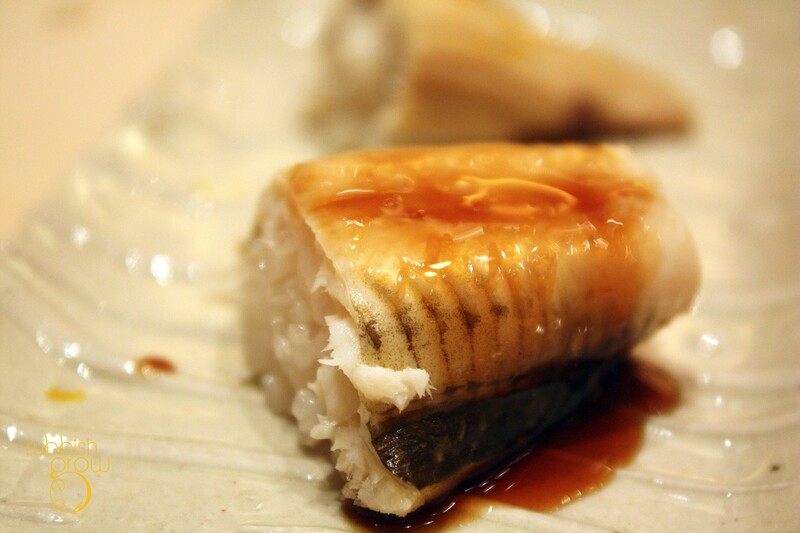 Michelin-starred Sushi Ichi in Japan comes to Singapore! 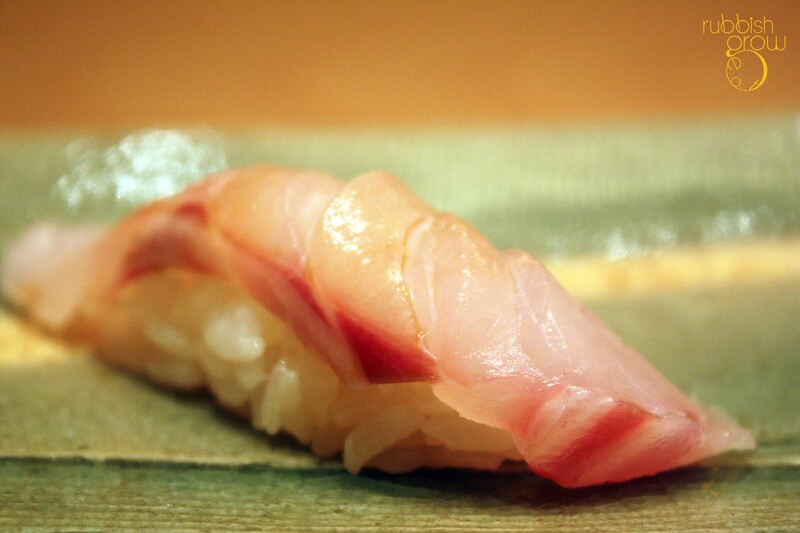 Ingredients are imported four times a week from the famous Tsujiki market in Tokyo to ensure freshness. 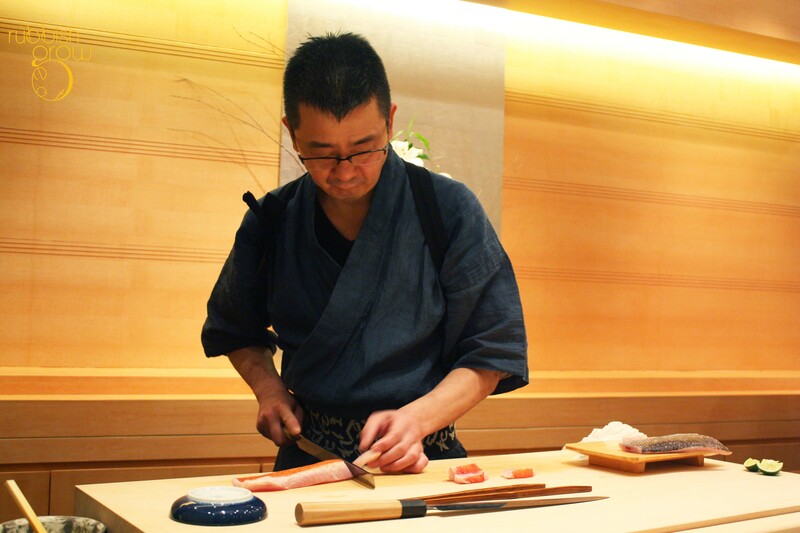 Chef Yabe Yuji–you should address Japanese by their surnames first–known for his accomplishment in Ginza Kyubei, top sushi restaurant in Japan, is in charge, assisted by Chef Sudou Hiroki who is famed for his kaiseki art. 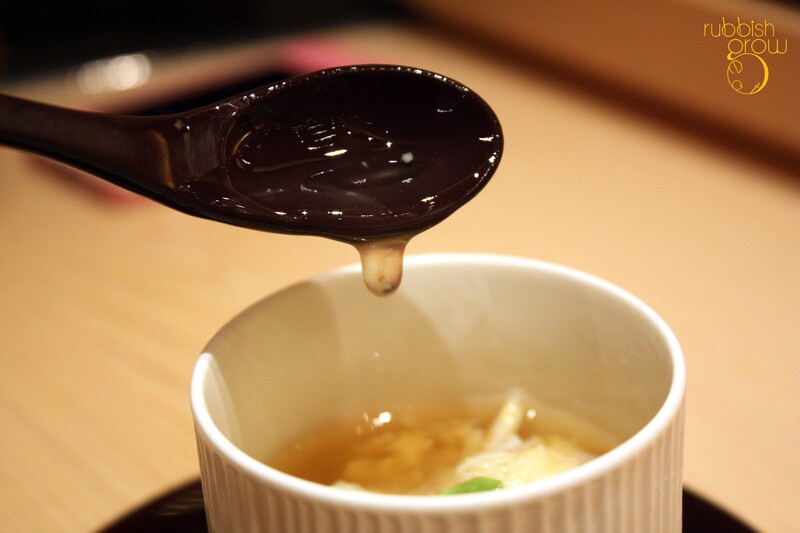 (Kaiseki art is the skills involved in preparing multi-course traditional Japanese dinner.) Awesome! Two great chefs under a roof. 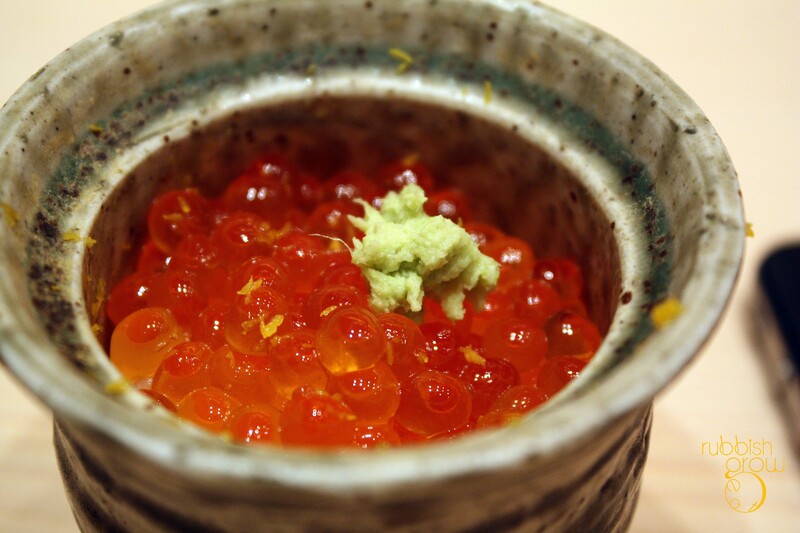 Located beside La Luna Rossa on the second storey of Scotts Square, Ginza Sushi Ichi is very discreet and exclusive, almost afraid that people may find out about its location. The signboard is so tiny that you have to zoom in to see it. We love the secrecy! A 12-seater around the sushi bar, with two private rooms accommodating another 12 people, the decor is to resemble a Zen sanctuary. Light wood always gives me the impression that it is a cheap place but the counter table is made from ancient Hinoki wood. I molested the table many, many times. Instead of giving a “cheap” feel, the ambience is amazing; we felt like we were transported into a tavern in Japan. 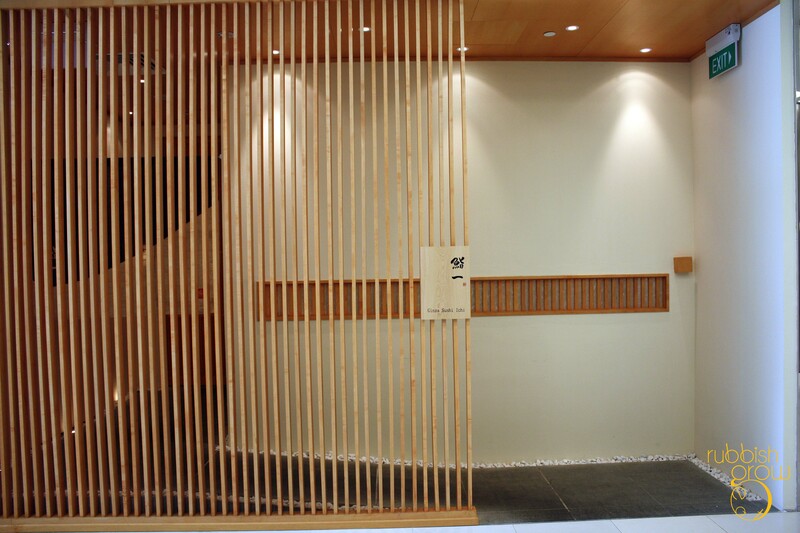 It has a very authentic feel and I read that the design is completely similar to the restaurant in Japan. I’d strongly recommend a counter seat as the sushi is made in front of you and served to you directly. Traditionally, you are encouraged to chat with the chef but in our case, it is difficult since we don’t know Japanese. Chef Yabe sliced the meat. It was very terrifying to see him slice the ginger so thinly we were afraid he might slice his thumb. Here is the damper: food isn’t cheap. Degustation menu starts from $60-$250 for lunch and $210-$450 for dinner. OUCH. 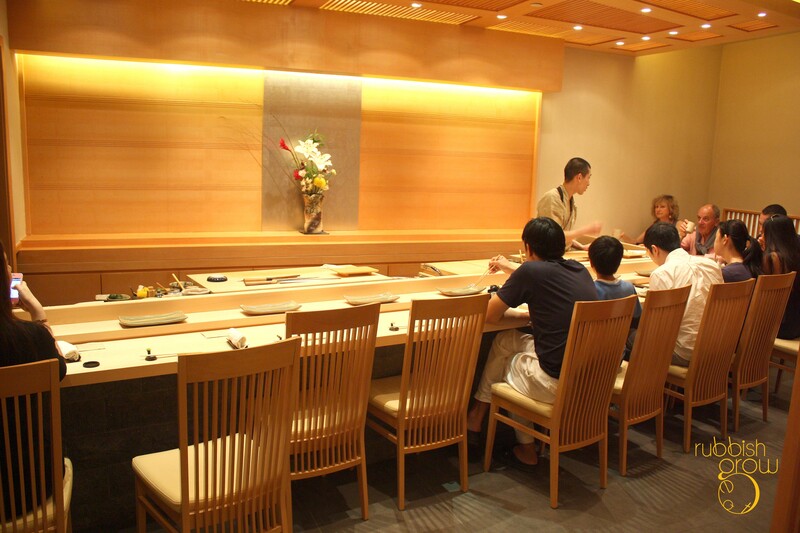 We opted for the Tsubaki set ($110) , which has an appetizer, assorted dishes, 9 pieces of sushi, miso soup and a dessert. 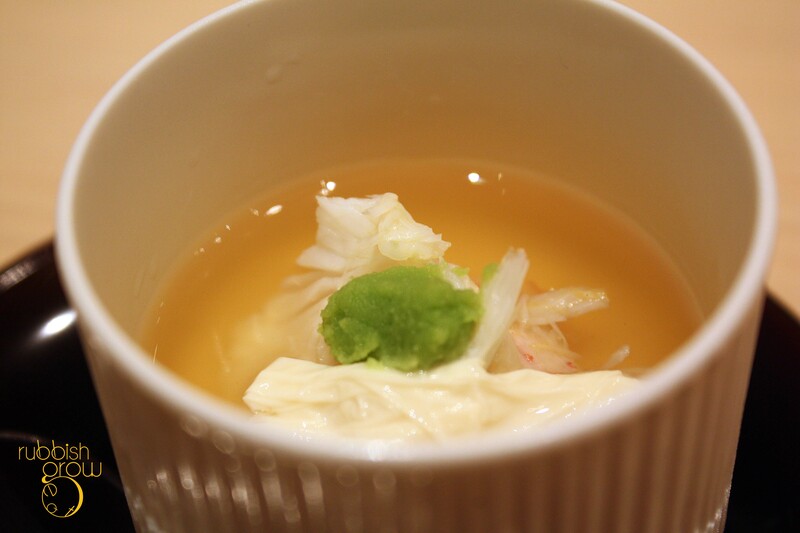 Cold chawanmushi (steamed egg), crab meat, bamboo, tofu skin in a jelly broth. 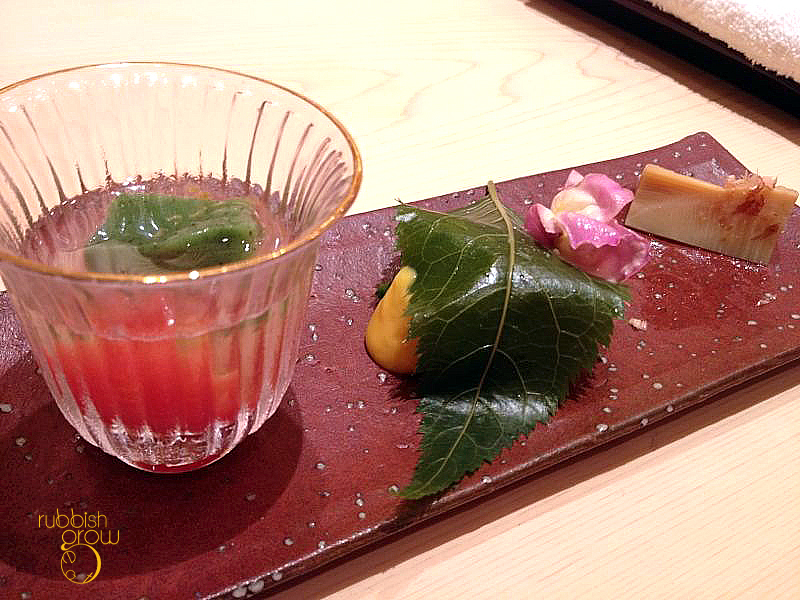 From right to left (usually for Japanese food, you eat from right to left, east to west): bamboo (a delicious woody flavor); edible sakura flower and leaf with prawn and hollandaise sauce; and cherry tomato in a sweet liquid with green-tea jelly. 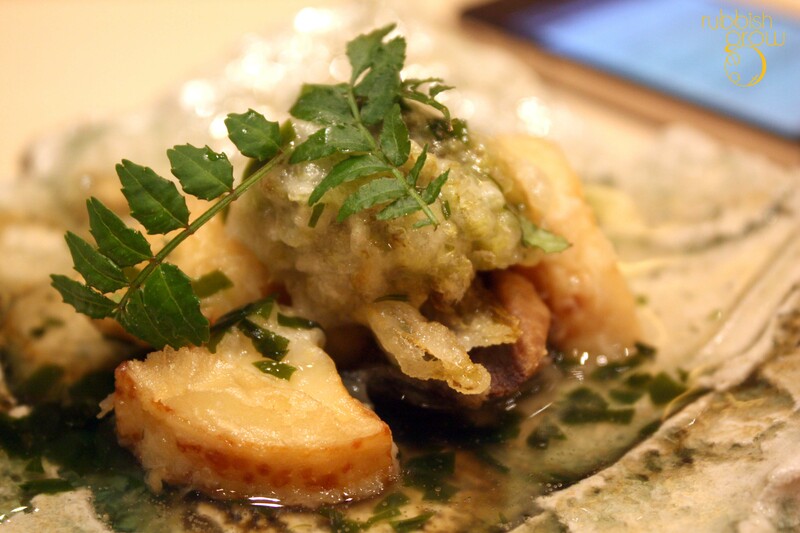 Assorted tempura (including mackerel) in seaweed sauce. The dessert is nothing spectacular–Japanese aren’t known for their desserts anyway–just a choice of ice cream or sorbet. We had sakura ice cream and watermelon sorbet. Food: Except the watermelon sorbet which, Chiobu said, had a stench as if the sorbet is put in the freezer with meat, all the food is stunning and delightful. Every morsel is exquisite. 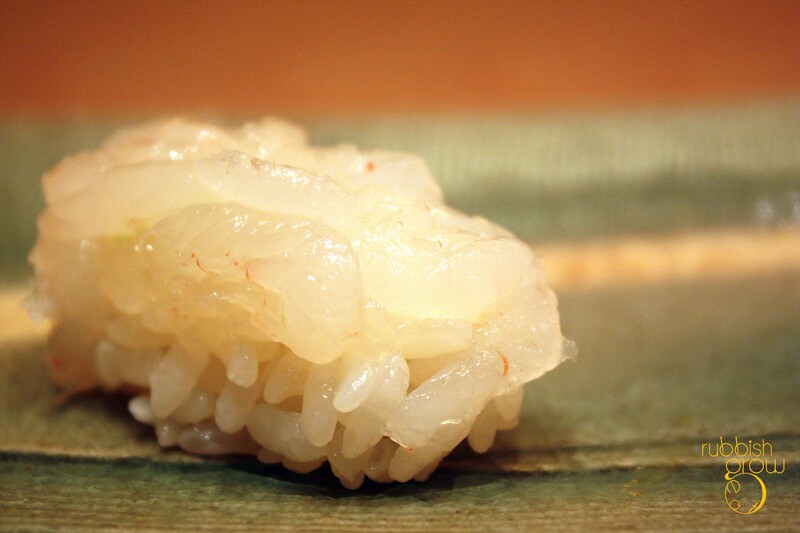 Chef Yabe pays attention to the tiniest details, even the wasabi is freshly ground. We witnessed the other chef at the counter (beside Chef Yabe) throwing away a piece of prawn because it wasn’t up to his standards. 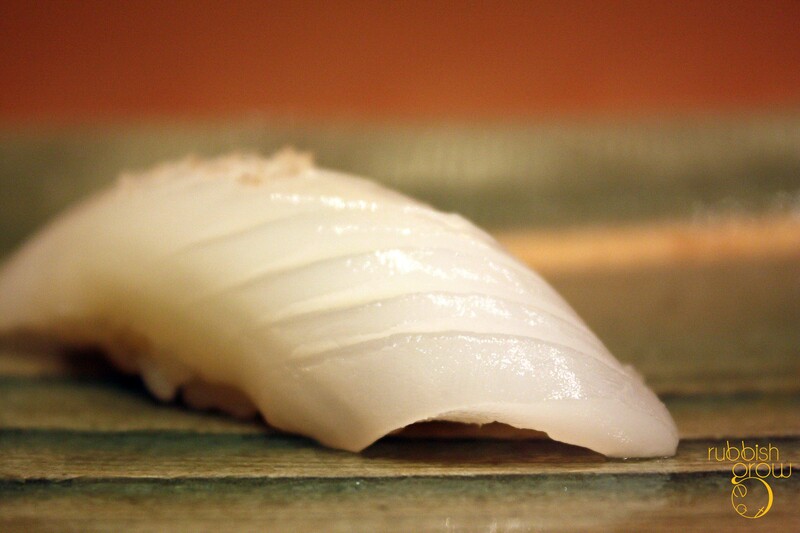 While the cooked dishes are outstanding, the real star here is the sushi. 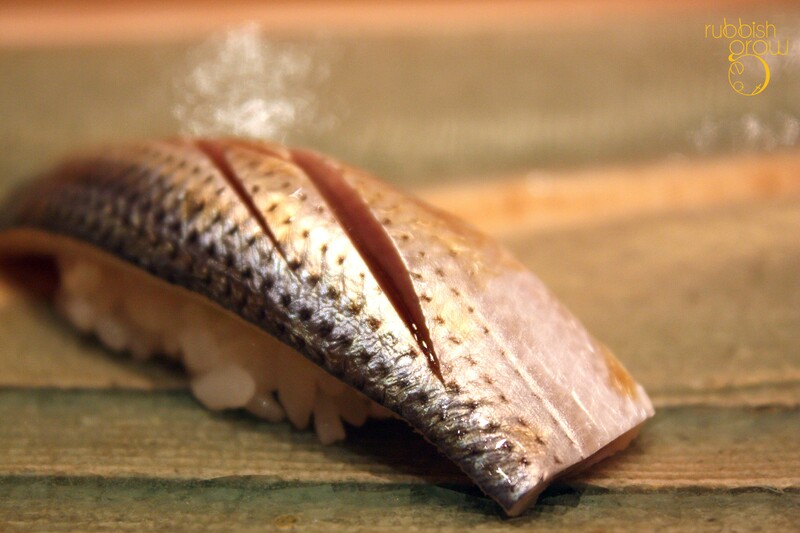 The arrangement of the sushi–which comes first and which comes last–really titillates our tastebuds. 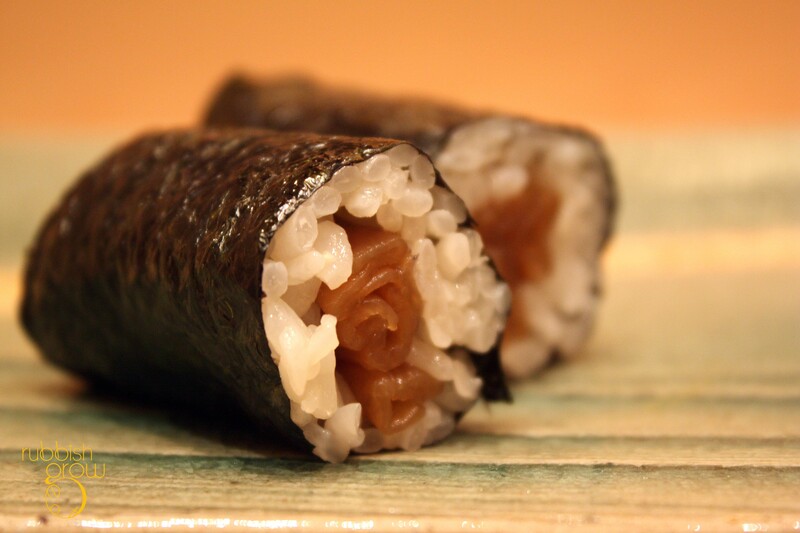 The sushi are, in turns, salty, fishy (in a good way), squirmy (in a good way), chewy, milky, zesty, sweet, refreshing. Really good that we don’t mind paying $258 for two but we wonder if we will pay $450 each for dinner. Come for lunch! 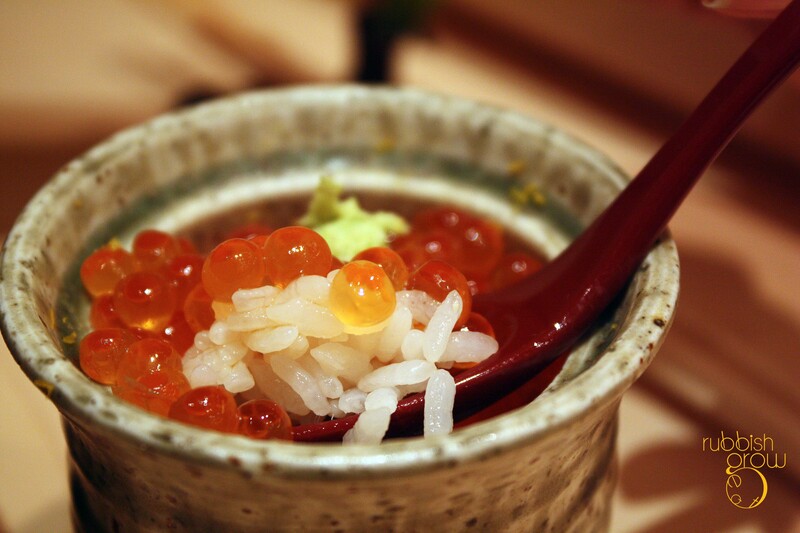 Overall: If you can’t travel to Japan, then let Japan come to you! 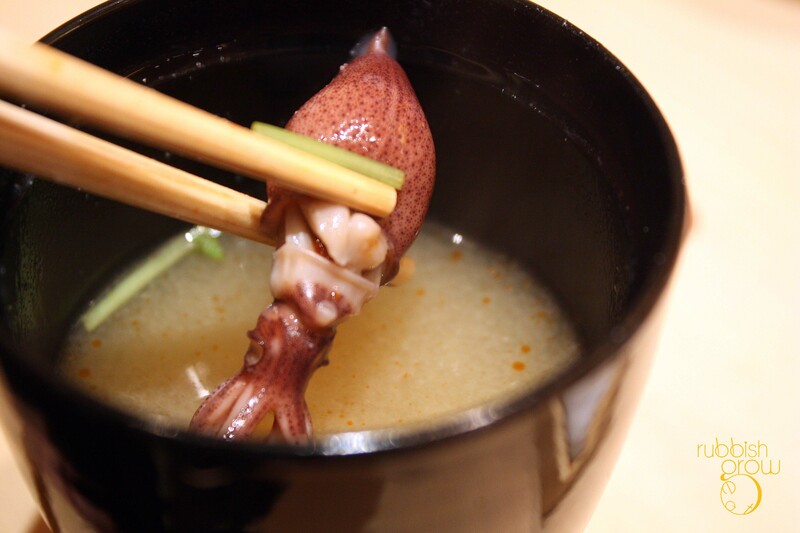 This restaurant transports us to Japan.This meal is a superb experience and we foresee ourselves coming back on a regular basis. The food is so fantastic We found ourselves thanking Chef Yabe at the end of the meal. We would have given an ovation for him. We love this restaurant so much we bought tickets to Japan! By the time you read this, we’d already be in Japan. 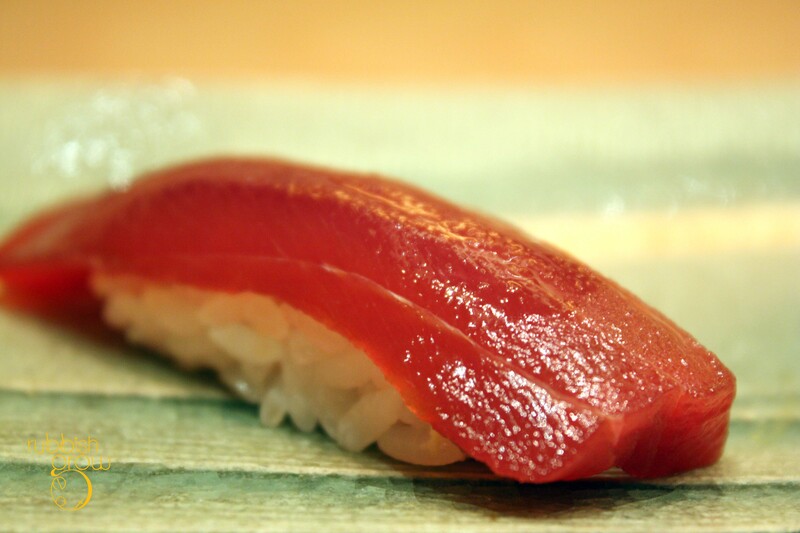 Will report back on the Sushi Ichi in Tokyo. PS: Thanks Chiobu for the treat! We have just been to the sushi stall. So good!! you sum up my review in a sentence. lol. I like the design of the place!